Fredonia is nestled among rolling hills alongside the Milwaukee River. Located 30 miles north of metropolitan Milwaukee, the village is a thriving community that maintains its own industrial park without losing its rural charm. Find out more about Fredonia on the Village Website. Guy & O’Neill’s commitment to providing meaningful solutions that make life easier extends to our hometown as well. In fact, we believe businesses have a responsibility to support their communities. G&O actively supports local organizations through donations, sponsorships and participation. Our major charitable event is the annual food drive for The Food Pantry in Port Washington, Wisconsin. G&O donated more than 300 pounds of needed items in 2015. We also donate to many local and national charities and organizations, including the American Cancer Society. When one of our team members was diagnosed with cancer, the entire organization banded together to support her. We made bracelets and T-shirts, participated in fundraisers and created the opportunity for her to fly an airplane. When Vicky lost her battle, we were all devastated. 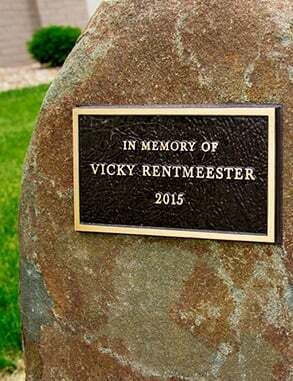 In her memory, we had a memorial bench built, and a dedication celebration with her entire family was held at our offices to remember a truly amazing G&O team member.